The International Coach Federation Cleveland Chapter offers sponsorship opportunities for you to market your school, business, products, and/or services to a wide range of professional coaches as well as to support the coaching profession in general. As winners of the International Coach Federation’s 2018 Chapter Excellence Award, we have an increasingly high-performing presence in the northeast Ohio region, the Midwest, and worldwide. 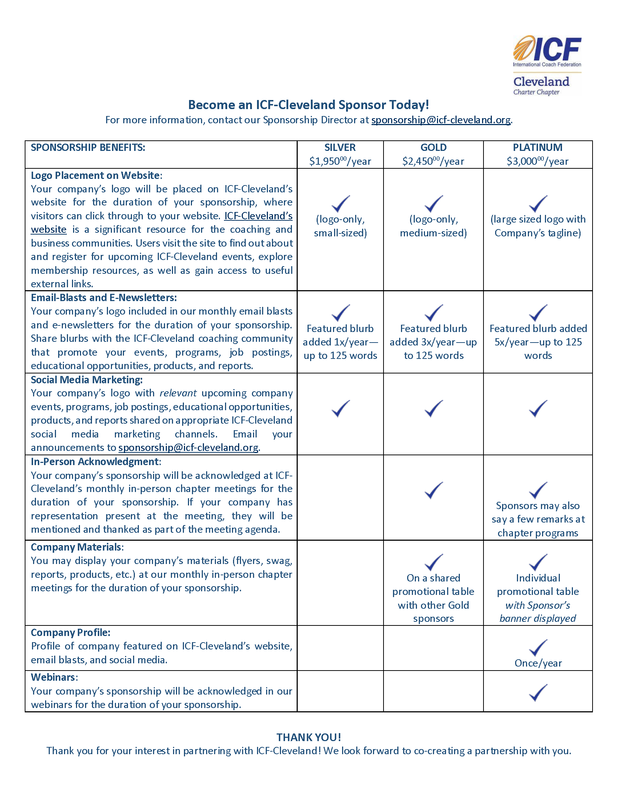 Keep your company’s products and services top of mind through our regular ICF-Cleveland email announcements, social media presence, and in-person chapter events. In addition, our chapter hosts 11 monthly in-person chapter programs annually, as well as numerous webinars, designed to inspire, educate, and connect the coaching community. ICF-Cleveland has 100 members with a wide variety of specialties and levels of experience—from individuals who are considering entering the coaching profession to master coaches. Our members’ specialties include ADD/ADHD, Career, Communication, Diversity & Inclusion, Executive Leadership, Family Relationship, Health Wellness, Presentation, Spirituality, Organizational Development, and Women’s Empowerment. Sponsorship packages offer a variety of creative ways to get your brand recognized so that you can stand out amongst your competition as well as connect with a wide range of professional coaches. You are eligible for a 10% discount (discounts must be pre-paid). We welcome credit card and check payments. Payment must be made in full. Contact our Sponsorship Director at sponsorship at icf-cleveland.org. We can also work with you to customize a sponsorship and benefits package that meets your needs and budget.